Tusa Wrench Set (2) Disassemble, Assemble, & Torque Tusa® S40 - S50 Second stages. The Tusa® Wrench Set provides a variety of specialized functions for the repair of the Tusa S-40, S-50, and R-300 regulators. The wrenches feature a 19mm and 22.5mm open end design for removing, installing, and torquing second stage components that can not be accessed with a standard wrench. The wrenches can be used either individually or together to service these parts. One of the wrenches has a center broached square hole that allows either size wrench to used as a torque extension (crowsfoot). The other wrench features a pin spanner in the center of the wrench for removing/installing the adjusting screw assembly on the R-300 first stage. The Tusa Wrench Set is machined from high strength aluminum alloy, and the pin spanner utilizes removable SS tension pins. 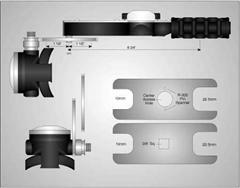 Shipped with complete instructions including the method of calculating torque when using a torque extension.